Designed with the outdoor enthusiast in mind, waterproof and fully rubber armored. Phase coated BaK-4 prisms for increased contrast and resolution. Fully multi-coated optics provide brighter images by increasing light transmission through the entire optical path. Close focus of 9.8 feet for viewing nearby subjects. Sturdy, twist-up eyecups with multiple stops. Eyeglass friendly with 16 mm of eye relief. 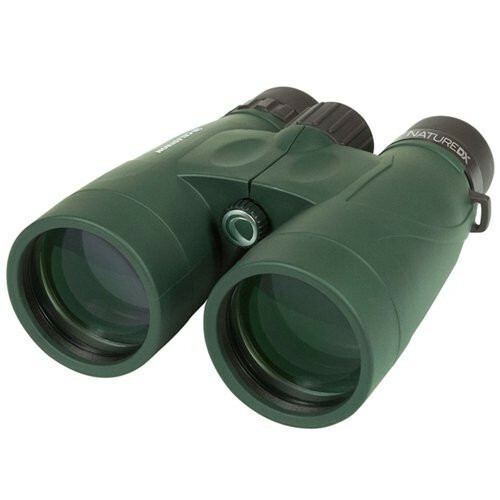 With 12x magnification and 56mm objective lenses, Nature DX 12x56 strikes the perfect balance between performance and ease of use. Acquire and follow your subject quickly in the wide field of view. Or, observe nearby subjects like plants and insects with a close focus of just 9.8 feet. Angular Field of View 5.5"